Once the lower level is framed, the main level floor joists are laid on top. 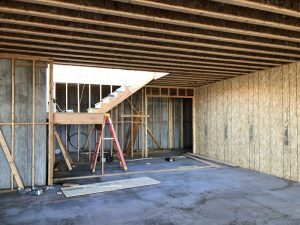 When the floor sheathing is added over the joists, we can walk around and begin to get a sense of the space and views from the main living area. 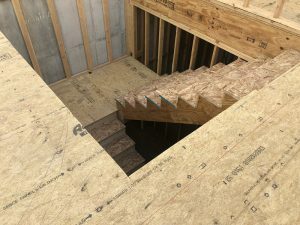 Everyone is happy when the stairs are framed and they no longer have to move up and down on ladders. In order to provide maximum stability for a home, the structural engineer determines strategic locations for shear walls which will resist the twisting motion of an earthquake. 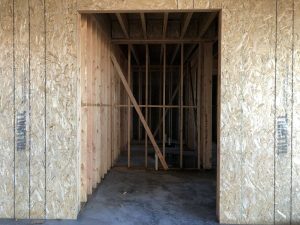 This simply means that these walls will be sheathed in plywood before the Sheetrock goes on. In the end, no one will be able to tell which walls are shear walls, but we can rest assured that the structure is well engineered for the foreseeable future. In order to provide maximum stability for a home, the structural engineer determines strategic locations for shear walls which will resist the twisting motion of an earthquake. ← Hillside Villa: Taking Shape!